There's a lot of confusion in the world about religion, and what the right path is. Whether it's Judaism, Christianity, Islam, etc., there must be an absolute path to take since all religions are diametrically opposed to each other. Is it one God? Or many gods? Are all the names equating to the same spirit? Or is it all a mixed bag of confusion? Since God is not the author of confusion, this series will make it absolutely clear by unraveling the truth behind each and answering the hard questions. With so many belief systems and the heart of man trying to fill a void that only God can fill, some people find themselves involved in strange spiritual groups that sometimes lead to awful consequences. Some of these cults are ran by people who really believe that they are God. Could you be involved in a cult? Have you been deceived by a pseudo form of Christianity? Have you been told that you can become your own god? Well this series also covers the controversial topics of cults and why there are so many in the world today. Satanism, witchcraft, sorcery and so on. We've all heard of these from one time to another. With the continuing rise of Neo-Paganism, it should be no surprise that the occult is flourishing in these last days. If you want a better understanding of this dark belief system then this series is for you. The war in the spirit realm is very real and you need to be equipped to deal with the realities. We'll go behind the secret teachings, history and practices, leaving you totally informed. As with all of Billy Crones' studies, this look into "Scientology" is beyond reproach in its' depth and detail. 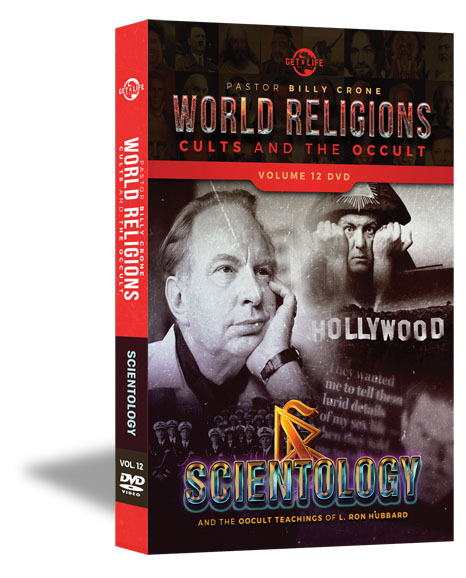 It goes well beyond the Lea Remini TV series in exposing the origins and inner workings of the Scientology cult. One cannot help but wonder about the gullibility of any people that would fall for this obvious scam. L.Ron Hubbard must have seriously taken to heart the P.T.Barnum statement about "a sucker being born every minute...".